The current edition is special edition to celebrate UWA's Centenary. This special edition was first published on print and made available online. Past Issues are archived online. 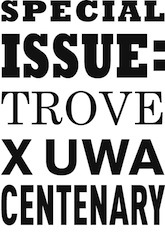 This Special Issue of Trove is a curation of articles written by our editorial team to memorialise UWA’s 100 years through the beauty of text. It features tales and memories that our editors have devotedly traced and captured. While originally established in 1996 as a hard copy journal for creative writing students at the University of Western Australia, Trove has evolved into an international online creative arts project. In its digital incarnation since 2010, Trove is now facilitated by postgraduate Project Officers and a small team of undergraduate Student Editors. 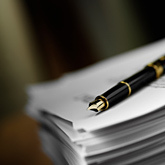 We mentor Student Editors in editorial work and the publishing industry, and publish internationally solicited works in running issues, ongoing reviews, and a digital poetry initiative. Trove is an open-access journal proudly supported by The Cultural Precinct and The School of Humanities. As a primary focus Trove aims to provide our Student Editors with a teaching and learning experience that resembles a professional publishing industry environment to assist with future employment opportunities. Trove also endeavours to support, nurture, and provide on-going feedback to beginning, developing, and emerging students within the creative arts in a university context. Finally, Trove aspires to provide students worldwide with opportunities to present their work for open-access publication. Thank you for picking up this Special Issue and joining us as we celebrate UWA’s centenary in stories that capture our heritage, our memories, and our hopes for the future.